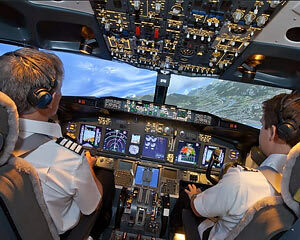 Have you ever dreamt of flying a commercial jet? This simulator will let you experience what it is really like to fly without ever leaving the ground! The jet simulator is a full-size reconstruction of the cockpit of a Boeing 737-800, it is even made from real Boeing parts! With a 3m high screen and 4 projectors, you can experience an amazing 200-degree vision from the cockpit, just like a real aircraft. The quality of the sound and images will have you feeling like you are up in the air without ever leaving the ground! In your 30 minute experience, you will have a quick overview of the controls and fly with a copilot who can walk you through the different instruments and navigational tools as you fly. You will be able to attempt things you would never dream of in real life. Pick from 19 different airports to enjoy your flight sim experience. There are two economy class seats inside the simulator so that you can have your family and friends join you in the flight deck area to watch you fly the 737. Alternatively, our waiting lounge is equipped with additional airline seats and a full HD monitor for others to view your experience. Children under 10 must be supervised inside the simulator. For a child under 12, please contact us to enquire if this experience would be suitable for your child. Wear comfortable clothing, pants are preferable and enclosed flat shoes. Please note the flight deck is air-conditioned so it can get quite cool.